Discussion in 'How To' started by Mick West, Jul 18, 2013. 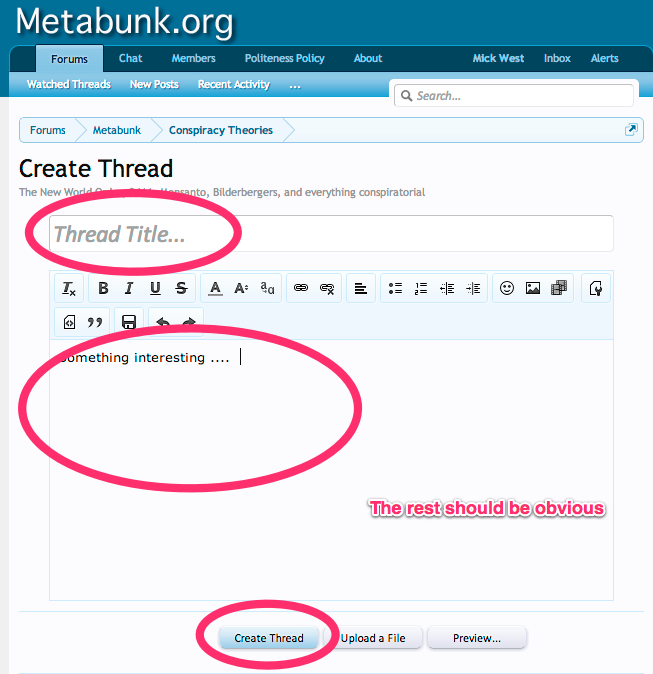 Basically you select a forum, then click on "Post New Thread". Tried to start a thread, but was told: ' Your message contains a video that does not have an adequate description'. (It does). ... 'All videos should be accompanied by a description of the point of evidence in the video that you want to convey., together with a time location '... I did ask for the video to be debunked- that's the whole video- there's an awful lot to go through, it's simpler to just watch the video than write a list of all the points- that's why we have videos. No. Its simpler to list the specific claims (possibly each its own thread) you want debunked rather than make everybody watch a lengthy video in hopes they will debunk a gish gallop of claims. One doesnt debunk videos, one debunks claims of evidence made in videos or elsewhere. the onus is on you to specify the specific claims you want debunked. Also to contribute an idea, since I don't know exactly how long the video that you wished to upload is --- if it's very long and covers multiple issues, then it might be advisable to edit it into "chunks" (if you have that capability). Each "chunk" could then, as suggested, be addressed in individual threads. So how do I start a new Forum subject. Or is that only the province of the administrators? Pretty sure that's just admin. @Mick West ? Yes. The individual forums are just collections of threads on particular topics. 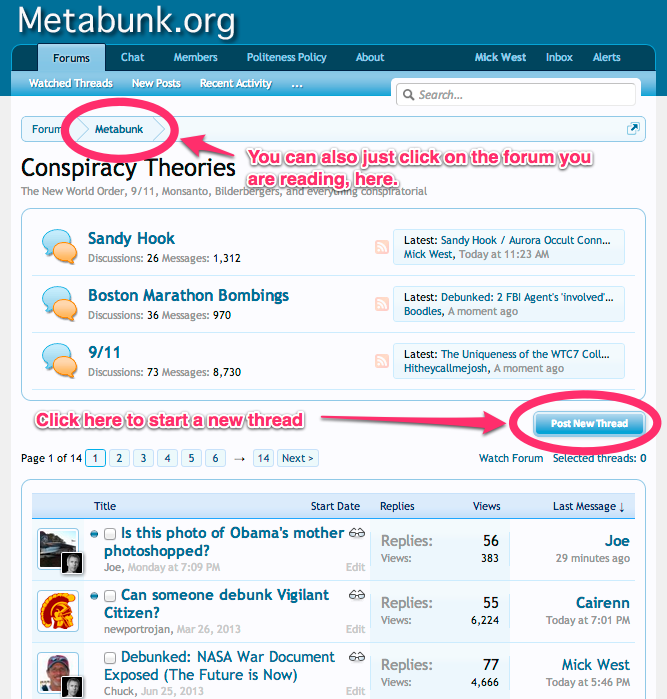 New forums or sub-forums are added very rarely (by me) for popular topics like Sandy Hook. So how do I start a new Forum subject. 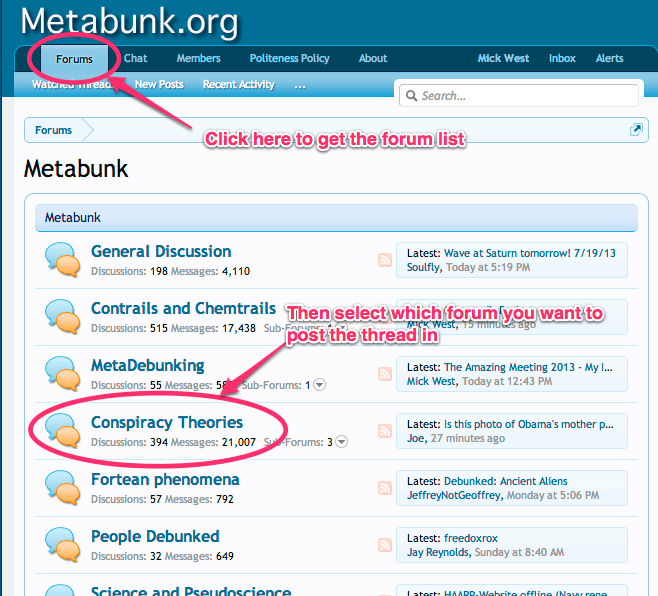 You have a new forum subject that's not already covered by the existing ones? Wow, I'm intrigued. What is it? Is there any way to edit my thread posts for grammar errors and is there anyway to delete a post? Post editing is limited for new users to prevent spam. Once you've made a few posts you can edit posts. If there's an grammar emergency you can ask a mod. I recommend proof-reading before posting.